Last month, my colleagues on the TechnoServe board of directors and I had the privilege to witness the effects of this type of change in Mozambique, where more than half of the country’s 23.5 million people live below the poverty line. Mozambique was the site of our annual international board meeting, which allows our leadership to see the work firsthand and engage with our clients, beneficiaries, local partners and staff. TechnoServe began working in Mozambique in 1998, only six years removed from a 15-year civil war that devastated the country. Today, it’s our largest country program. Our team, led by country director Jake Walter, has identified a vision for Mozambique and created sustainable economic growth that is improving the lives of poor people. Critically, TechnoServe acts as a catalyst for change across industries in Mozambique. Our team uses a structured approach that works to address the entire market system. We work directly with entrepreneurs and farmers, promote investments, help to structure deals, advise government officials, advocate for policy change and think about how to promote and export Mozambican products. This comprehensive approach has made a difference on a large scale: In the past five years, TechnoServe-assisted businesses in Mozambique have generated more than $76 million in revenue, buying from more than 154,000 smallholder producers and creating more than 6,200 jobs. During the board’s visit, we saw what this impact looks like on the ground. We visited Novos Horizontes, a poultry business located near the city of Nampula in northern Mozambique. With support from the U.S. Department of Agriculture and U.S. Agency for International Development, TechnoServe began working to develop the domestic poultry industry in 2005. With our assistance, the industry’s sales have grown from $20 million in 2005 to more than $120 million in 2011. 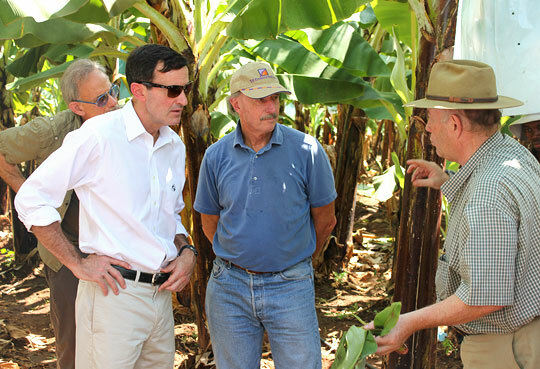 As a result, businesses such as Novos Horizontes are creating new opportunities for workers and farmers in the region. The company’s feed mill processes soybeans and corn from local farmers, and it contracts with smallholder outgrowers who raise chickens. Novos Horizontes has become an economic engine in its community – as have other poultry companies in the region. In total, the poultry industry is contributing to the incomes of more than 2 million Mozambican smallholder farmers. We also visited a cashew factory owned by Condor Nuts – the largest in Mozambique, with more than 1,500 workers. During our visit, the factory floor buzzed with activity as hundreds of employees worked to extract and process cashew nuts. TechnoServe helped revive the cashew processing industry in Mozambique by working with entrepreneurs to establish factories based on a labor-intensive processing model. Between 2002 and 2008, Mozambique went from processing zero cashews to becoming the largest processor in Africa and the fourth-largest processor in the world. The industry now employs more than 5,000 workers, with annual sales of about $25 million. Today, TechnoServe is working to achieve this kind of success in industries including fruit, soybeans and forestry. Finally, we visited the tree nursery of Green Resources, a forestry company that is partnering with TechnoServe to incorporate improved smallholder farming and eco-tourism in its forest concession area. The company is using an innovative consultation process developed by TechnoServe to ensure that it is responding to the needs of the local communities where it operates. Over the past eight years, TechnoServe has been instrumental in increasing the number of plantation forestry companies in Mozambique from one to seven. Over the next decade, these companies plan to invest more than $4 billion in the country, plant more than 1 million hectares of pine and eucalyptus trees and employ more than 100,000 workers. As we traveled through Mozambique and saw the evident signs of poverty all around, I thought about these big numbers. Yes, the scope of poverty in Mozambique is daunting. But business can be an engine of change. By targeting transformation at the industry level, we can meet the challenge of global poverty and improve lives on a large scale. 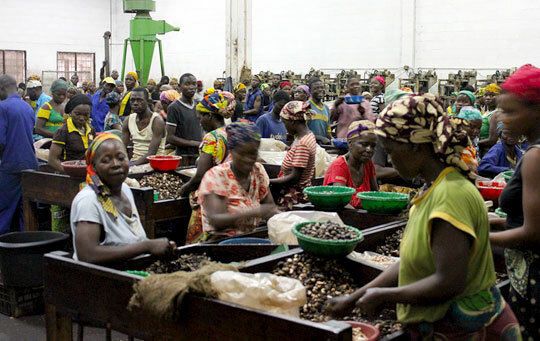 (Workers process cashews in the Condor Nuts processing plant. Established with TechnoServe’s support, the factory employs more than 1,500 people).